Betfair Ambassador Paul Nicholls provides the insights into his runners at Newbury on Saturday afternoon, including the return of a Gold Cup prospect, and one at Warwick. "This race has been the plan since he won at Kempton over Christmas and he worked enthusiastically on Thursday morning. He has done plenty of graft in the build up for this and his schooling has always been out of the top drawer." Has had time off after injuring a tendon but is ready to go now even if he is sure to come on for the run after such a long absence. I'm pleased to have The Eaglehaslanded back as he had some fair form to his name last season. I'm hoping for a promising run here that will set him up for a spring campaign over fences once the ground dries out. He is a high-class horse who thankfully has fully recovered from injuring a fetlock joint when he fell in last year's Grand National. I've drilled plenty of work into him, he's had a racecourse gallop and he has also done plenty of schooling. Yet I suspect racegoers at Newbury will probably think Saphir Du Rheu looks a bit big in the paddock and they will be right because he is still a fraction on the burly side. He has to run somewhere if he is to make it to the Cheltenham Gold Cup in which he was beaten only six lengths a year ago. I'm trying him in a tongue tie for the first time and would say he is bound to improve for the run which should hopefully put him spot on for another crack at the Gold Cup. This race has been the plan since he won at Kempton over Christmas and he worked enthusiastically on Thursday morning. He enjoyed a little break after Kempton, has since done plenty of graft in the build up for this and his schooling has always been out of the top drawer. 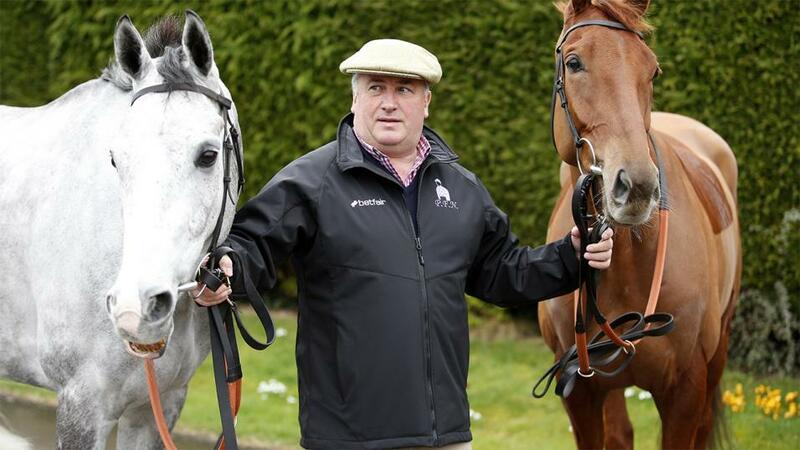 Politologue is fit and ready for this race which comes at a perfect time in the calendar ahead of the Queen Mother Champion Chase which has been his main target all season. A good run here should to put an edge on him for Cheltenham. We are looking forward to taking on Altior and are confident of a big show against him provided we get a fast run race which, unfortunately, is not guaranteed. It's good to have Divin Bere back at Ditcheat though he was a bit too keen on his return to action at Ascot in December before tiring late on. While he has come on for that run, and is in good form at home, I'm concerned that his current mark of 144 is a shade too high for him to be competitive in a seriously tough handicap like this. Any more rain at Newbury will not suit Divin Bere who looks to be up against it in this. Another of ours that has been off for a year with a minor stress fracture. An excellent jumper who has always shaped as though he will stay well, he ran some excellent races in defeat last season. I've had to be patient with Ibis Du Rheu who didn't come back into training at Ditcheat until mid-December. While most of mine are plenty fit enough when they get to the races I imagine this one is sure to need this first run after almost a year off and will improve a great deal for it even though he has had a racecourse gallop. I'm looking for an encouraging showing that could put him on course for the four mile NH Chase at the Cheltenham Festival. A lovely young prospect, a gorgeous, scopey-looking horse who had a tall reputation after winning his only bumper in Ireland in October. We bought him shortly after that with chasing in mind and so far he has done everything nicely at home. But he is not really a bumper horse and is running in this because I felt it was too late to be starting him over hurdles at this stage of the season. So this is something of an exploratory mission for Danny Kirwan whose Irish trainer Pat Doyle spoke highly of him. We think he will have a decent future once he goes over hurdles in the autumn. I was in two minds about running Diego Du Charmil and only decided that he should go for this when the race was re-opened at ten on Friday morning. The key thing is that he needs good ground and the going at Warwick, while not ideal, should be better for him there than anywhere else where he has entries. He is a smart horse on the right ground and jumps very well but has been on the easy list since striking into himself badly when he last ran at Newton Abbot in October. That forced him miss the best part of three months so he is another of mine tomorrow who should improve for the run. While he is fit and always runs well when fresh I am worried that the ground might still be too testing for him. Then again, as Dolos showed a week ago, they do cope better in unsuitable conditions as they get older and stronger.